Hello and welcome to the 124th installment of the SWD. Liwa Ahrar al-Shamal, led by Muhammad Diab al-Hussein (Abu Asaed) and based in northern Aleppo, released a statement confirming their incorporation into Faylaq al-Sham. Islamic State briefly captured 17th Division military base, north of Raqqa, from Syrian Democratic Forces which reportedly withdrew from it, and then entered it again after several CJTF-OIR‘s airstrikes. Syrian Democratic Forces clashed with Islamic State on a number of fronts in Raqqa, and made small advances in the city. Islamic State allegedly lost at least 50 fighters today in Raqqa. Islamic State’s inghimasi (suicide fighters) reportedly conducted an operation against SDF in Al-Jazrah district, west Raqqa city. According to Amaq, 19 SDF‘s fighters were killed during the encounter with IS’ inghimasi which lost two men, while the rest safely withdrew. Syrian Arab Army advanced against Islamic State south of Tabqa. Rather than going west and creating a large IS’ pocket east of Khanaser, SAA decided to first move to the east and deprive SDF of the ability to capture more ground from Islamic State south of Tabqa. Today SAA captured Rajm al-Harrah, Al-Sufyan, Jub al-Afabos, Saharij al-Wahab, and Jub Mushrafa. Suicide bomber detonated himself near the Abu Dhar al-Gharafi mosque, Idlib city, as the high-ranking figure in Hayat Tahrir al-Sham, Abdullah al-Muhaysini was present in the area. Target of the attack, Al-Muhaysini, wasn’t injured in the attack, but one person was killed and at least 10 were injured. Unknown gunman assassinated Ibrahim al-Saleh, Hayat Tahrir al-Sham’s sharia judge of Al-Dana court. In a separate incident last night, in Sarmin, unknown gunmen killed one Hayat Tahrir al-Sham’s fighter and wounded two more. Syrian Arab Army captured Tall Tabaret al-Deibah from Islamic State in eastern Hama governorate. 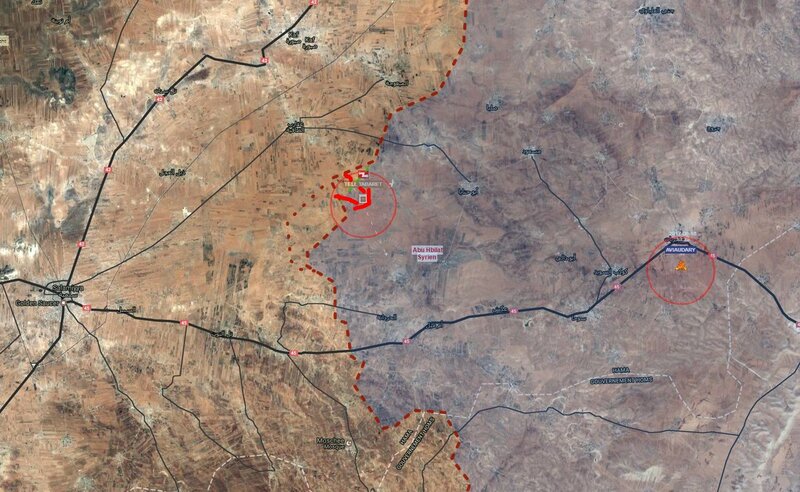 Heavy clashes are ongoing between Islamic State and Syrian Arab Army close to T3 airport, according to the former’s media outlet, Amaq Agency, SAA is currently seven kilometers (~4.3 miles) away from the locality. Since there wasn’t any footage released from T3 airport and since Amaq claimed the airport is under IS’ control, reports about SAA capturing the locality on the 14th of June, appear to be false. However, T3 airport and area surrounding it, should be treated as a disputed zone because of heavy clashes occurring there. Islamic State and Iraqi forces clashed at the outskirts of the Old Mosul district, the latter reportedly lost 12 soldiers due to IS’ snipers in Bab al-Toub neighborhood, Al-Nabi Shayt and Al-Kurnish street. Iraqi Army made new advances against Islamic State, east of Tal Afar by capturing several localities from the latter and encircling the villages of Mugharin and Tuaim. Captured localities today are Al-Zanazil, Abu Kador and Kanisa. Islamic State claimed an SVBIED attack targeted Iraqi forces in the village of Al-Boer, east of Tal Afar. Furthermore, Amaq reported one more event that occurred in the area east of Tal Afar, six mine-resistant ambush protected Cougar vehicle, a Humvee and a bulldozer were destroyed in clashes with IS’ around the village of Al-Mawali. Islamic State is particularly active around the village of Al-Mawali, this is their third act around it this week. In Al-Hamdaniya village, south of Baaj, Islamic State’s sniper reportedly killed two Al-Hashd al-Shaabi’s fighters. Five Islamic State’s inghimasi (suicide fighters) attacked Iraqi Federal Police’s HQ in Jubairia area, Samarra city. According to Amaq Agency, inghimasi killed 38 Iraqi troops. Iraq Joint Operation’s official comment on the situation says that Iraqi forces received intel about the attack and ambushed IS’ fighters near Muthanna neighborhood. Islamic State’s improvised explosive device destroyed Al-Hashd al-Shaabi’s (Popular Mobilization Units) vehicle near the market in Baiji. Prominent Islamic State’s female figure in “Wilayat Diyala”, known as Umm Jabir, was killed today along with two of hers underage sons (six and nine years old) when unknown gunmen entered Umm Jabir’s home at the outskirts of Hawijah. Umm Jabir was the wife of IS’ Emir of “Wilayat Diyala”, who is also deceased. Islamic State destroyed Iraqi Army’s vehicle, killed four soldiers and wounded a Brigadier General with an improvised explosive device in Al-Nada area, Balad Ruz. On the 15th of June 2017 CJTF-OIR has conducted 29 strikes in Syria. CJTF-OIR‘s main focus in Syria at the moment is Tabqa-Raqqa-Deir al-Zour region where they did 26 strikes supporting SDF‘s operations against IS destroying five IS oil storage tanks, six vehicles, an IS well head, nine fighting positions, three mortar systems, two supply caches, two IS headquarters, a heavy machine gun, and a home-made explosives factory. Other area where three airstrikes occurred is Abu Kamal (Al-Bukamal) destroying three IS well heads. Full report on CJTF-OIR strikes conducted in both Syria & Iraq can be found here. Yesterday, Islamic State reportedly killed three members of the Pakistani police and wounded an officer in their attack in Dwar Bendu area, east of Peshawar, Khyber Pakhtunkhwa province.